WASHINGTON (CNN) -- While President Donald Trump walked in his Inaugural Parade, protestors set fire to two vehicles just blocks away. At least one of the cars set ablaze was a limousine. The fires were set hours after a pair of police officers were injured and 95 protesters arrested after they smashed windows, damaged cars and threw rocks at police. 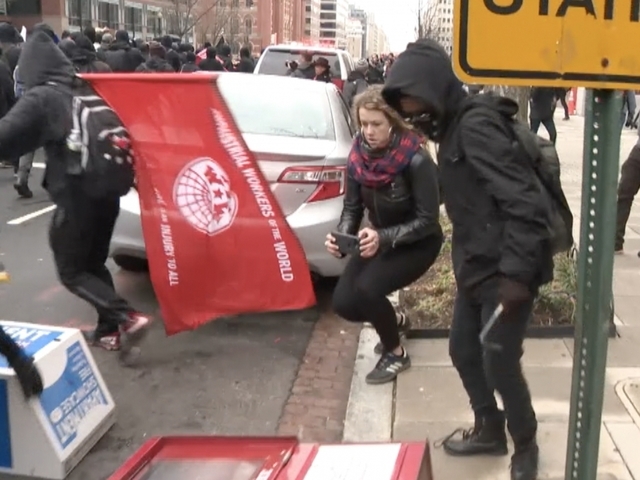 Two DC police officers and one other person were taken to the hospital for undetermined injuries after run-ins with protesters, DC Fire Spokesman Vito Maggiolo told CNN. The injuries are non-life threatening. 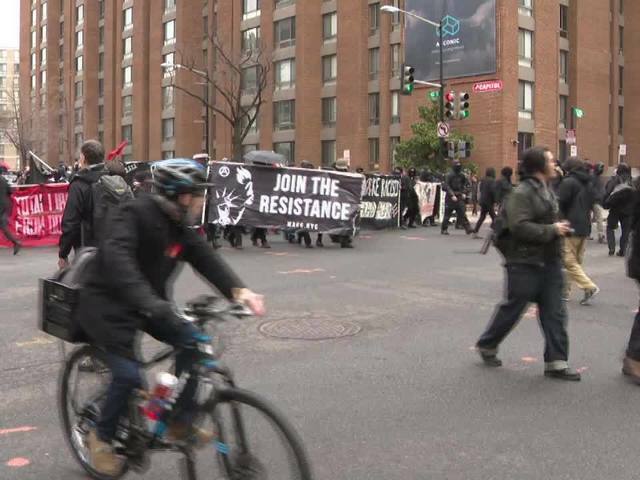 After the swearing-in ceremony, demonstrators near 12th and K streets were throwing rocks and bottles at police, who were in riot gear and attempting to disperse the crowd. A large number of police were using smoke and flash-bang devices to try to scatter the protesters. Acting DC Police Chief Peter Newsham told CNN that there were several hundred protestors who were confronting police, while thousands of other demonstrators were acting in a peaceful fashion to get their point across. 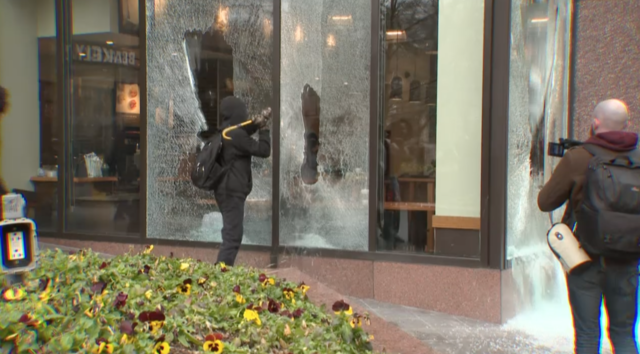 Protesters "acting in a concerted effort engaged in acts of vandalism and several instances of destruction of property," the police said in an earlier statement. "More specifically, the group damaged vehicles, destroyed the property of multiple businesses, and ignited smaller isolated fires while armed with crowbars, hammers, and asps." "Pepper spray and other control devices were used to control the criminal actors and protect persons and property," police said. "During the incident, police vehicles were damaged and two uniformed officers sustained minor injuries from coordinated attacks by members of the group that were attempting to avoid arrest." Earlier, a few blocks from the White House, building windows along the street were shattered, vehicle damaged and newspaper stands toppled. One business owner told CNN there might have been as many as several hundred protesters who swept through the area, some dressed in black. "I think Donald Trump is a fascist, and it's very easy for people, especially people who are in pain, to slip into fascism," said protester Lysander Reid-Powell, 20-year-old student from New Mexico. At one checkpoint, about 50 protesters sat down in the street in an attempt to block Trump supporters from entering a secure area to watch the swearing-in ceremony and speech. Not far away, a group of immigration backers staged a "pop up" protest near another check point. "We're here to take a stand against the ideas that Trump spouted throughout the course of this campaign -- sexism, Islamophobia, his bigotry and nationalism," said protester Jed Holtz, from New York City. Three women were chained together at the neck on 10th Street, and more than 150 demonstrators organized by the DisruptJ20 coalition surrounded an entrance near the Canadian embassy. "This checkpoint is closed," they chanted, forcing Trump supporters to turn back and walk along Indiana Avenue in search of a clearer path. As Trump was being sworn in, a half-dozen protesters, each wearing a letter of the word "RESIST," stood up from just behind the VIP area and began to recite the preamble of the US constitution as Trump recited the oath of office at noon on Friday. "The only source of light on this miserable day is the massive, multi-racial, multi-generational progressive resistance movement led by women and people of color that's already emerging to confront Donald Trump's agenda of hate and growing stronger every single day," said Democracy for America Executive Director Charles Chamberlain. There also were anti-Trump protests around the world, including in London, Hong Kong and Berlin -- where demonstrators held a sign that read, "Walls divide." In the West Bank, Palestinians protested against Israeli settlements and Trump's plan to move the US Embassy to Jerusalem from Tel Aviv. On Thursday night in Washington, protesters gathered on 14th Street outside the National Press Club to demonstrate against "DeploraBall," an event organized by some of Trump's most fervent supporters. The name riffs off the campaign description of some Trump backers by his defeated opponent, Hillary Clinton, as a "basket of deplorables." On Saturday, the Women's March on Washington could attract a quarter million participants, potentially making it one of the larger political rallies the city has seen. The Women's March begins near Capitol Hill at 10 a.m. ET Saturday. Organizers now say internal divisions, many of them stemming from a divisive Democratic primary fight, are being put aside in the name of solidarity. There are more than 600 "sister marches" now planned around the country and fundraising for the event has largely come in chunks of $20 and $30 online donations. CNN's Brian Todd, Sarah Ganim, Noah Gray, Dugald McConnell, Pallavi Reddy, Jeremy Diamond, Betsy Klein and Chris Welch contributed to this report.